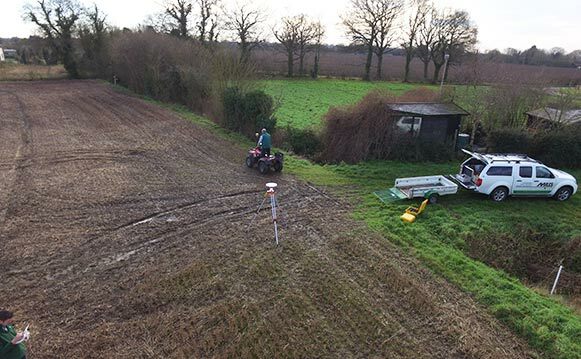 Utilising the RTK system that we have, our survey team are capable of carrying out a full topographical survey showing not only the land levels but also water and ditch bottom levels downstream. Each base station is capable of carrying out a survey of 28 square kilometres in a radius of 3km from the base station location. This survey can be used to show a background map and can have contours, watersheds, tributary lines and flow arrows added to it to help show the lie of the land. This has proved a very useful tool for those farmers who wish to re-profile their fields and it can be used to work out quantities of soil to shift to achieve the finished surface level. 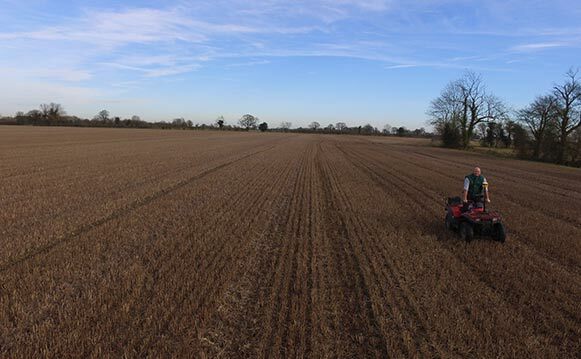 Our surveys can be carried out either on foot or by ATV/UTV dependant on the time of year, weather conditions and cropping. Where possible ATV is the ideal method to carry out the survey as large areas can be surveyed in a short amount of time while still being mobile enough to allow the operator to dismount to capture areas of interest ie. Ditch levels. This information, once back in the office, can be exported as a shape file to Gatekeeper® and as a result, it is the ideal tool for farmers who want to get a very accurate measurement of the field boundaries.